Noted Catholic scholar/writer Charles E. Rice, professor emeritus of law at the University of Notre Dame Law School, has authored a new book titled What Happened to Notre Dame?, published by St. Augustine's Press. 'Notre Dame's honoring of Obama is not merely a 'Catholic' thing. Many thousands of citizens with no Catholic or Notre Dame connections have protested it. They see it as a capitulation of faith to expedience and the pursuit of vain prestige. Obama's record and stated purposes are hostile to the most basic truths of faith and the natural law affirmed by the Catholic Church and by many others. Four decades ago, in 1967, the major 'Catholic' universities declared their 'autonomy' from the Catholic Church in the Land O'Lakes Declaration. The honoring of Obama reflects the replacement by those universities of the benign authority of the Church with the politically correct standards of the secular academic establishment and, especially, of the government. 'There is a lesson here for all Americans. Notre Dame fell into relativism and expediency because it rejected the Church as the authentic interpreter of the moral law. In this post-Christian era, American culture is following a similar path by reducing morality to the unguided consensus of individual choices. If no code of right and wrong has moral authority — not even the Ten Commandments — then society is ruled by the conflict of interests, and might makes right. The jurisprudence of such relativism is legal positivism in which no law can be criticized as unjust because no one can know what is "just." 'What Happened to Notre Dame? by Charles E. Rice, with an Introduction by Alfred Freddoso — two of Notre Dame's most distinguished scholars, who together have served the University 70 years — first recounts the details of Notre Dame's honoring of President Obama. It then examines the succession of fall-back excuses offered by the Notre Dame President Rev. John I. Jenkins, C.S.C., and University publicists to justify Notre Dame's defiance of the nation's bishops and of Catholic teaching. 'But Rice is not content with mere reportage. What Happened to Notre Dame? diagnoses the problem's roots by first providing an overview of the Land O'Lakes Declaration, its inception and its aftermath, including the ways in which its false autonomy from the Church has led to an erosion of the Catholic identity of Notre Dame and other Catholic universities. 'In the final chapter Rice shows why great good can come out of Notre Dame's blunder in rendering its highest honors to such an implacable foe. Notre Dame got itself into such a mess because it attempted to be Catholic without the Church and ended up defying the Church and disgracing itself. But good can result from the lesson here that roll-your-own morality is no more tenable than roll-your-own Catholicism. During the eight weeks from March 20 to May 17 the university kept insisting that the pro-life agenda was central to its mission, that its pro-life credentials were impeccable, and that honoring President Obama in no way undercut its "unambiguous" pro-life commitment. But the more these claims were reiterated, the less convincing they seemed. To paraphrase Bishop D'Arcy, Notre Dame's action spoke so loudly that it drowned out the university's claim to be unambiguously pro-life. And what the action said is that while abortion and the mentality it cultivates are bad, they are not really all that bad — not bad enough, at least, to prevent one of the most reliable political promoters of abortion in the history of American politics from being honored by Our Lady's university. Moreover, as Wilson Miscamble, C.S.C., intimated in his speech to 3,000 protestors at the alternative commencement rally on May 17, no one doubts that if the President's beliefs and actions had violated some important tenet of the left-wing political orthodoxy adhered to by most faculty members at the university, he would never have been invited or honored. In short, the consensus among the protestors was that the Obama controversy had cleared the air and allowed the university to be seen for what it is instead of for what it sometimes pretends to be. Anyone who knows the history of the Catholic Church in America realizes that during the first six decades of the 20th century Notre Dame loomed large in the consciousness of the immigrant Catholic communities that had come to populate the eastern seaboard and the Great Lakes region. Notre Dame's success, especially on the football field, was symbolic of the aspirations of hundreds of thousands of Catholic immigrants who were struggling to "make it" in America and to ensure a better future for their many children. If we concentrate merely on material success, then both Notre Dame and its alumni have indeed made it big in the intervening decades. And, in fact, many American Catholics — perhaps a majority, including a majority of Notre Dame alumni — were undoubtedly pleased to hear that the newly inaugurated President of the United States would be visiting Notre Dame to get an honorary degree. So who were those discontented protesters? This is really no great mystery, despite the ability of some social scientists to muddy even the clearest waters. If you are an American Catholic, then the more central Catholic belief and practice are to your life, the more likely you were to be upset by Notre Dame's decision to honor President Obama. Or, to put it as serious Catholics would themselves put it, the more centered your life is on Jesus Christ and what Vatican II calls your "baptismal call to holiness," the more likely you were to disapprove of the university's decision. You would also be more likely to think of yourself as 'countercultural' in many ways or, to put a more positive slant on it, as part of what Pope John Paul II dubbed the "culture of life," a community of people who first and foremost think of their own lives and the lives of others — both natural lives and supernatural lives — as gifts from God. But to be upset is not yet to be scandalized. For that, one also has to have gone some way toward accepting at face value Notre Dame's carefully crafted and relentlessly marketed image of itself as the "greatest Catholic university in the world." As a faculty member at Notre Dame, I want to apologize to Bishop D'Arcy for the breathtakingly shameful manner in which he has been treated by the administrators of my university. They think the bishop is out of touch. But the fact is that they themselves have lost touch with the faithful Catholics in the pews, the ordinary people who put faith in Jesus Christ at the very center of their lives — the families with lots of kids, including handicapped kids; the people who have spent years helping women with problem pregnancies, both before and after the birth of their children; the people who take care of one another in emergencies; the younger idealistic 'JP2' Catholics — in short, the very people who have been quietly building an impressive culture of life in our country right under the noses of those who have led Our Lady's university astray. These people do not have to reassure everyone that, despite appearances to the contrary, they are 'unambiguously pro-life.' They just are pro-life. And they instinctively recognize a great bishop when they see one." What one finds in Charlie Rice's book is all the background information needed to understand how this disconnection became a reality. The various factors on the university's side of the split can be accurately summarized by what I call "the four I's," viz., impatience, infidelity, ingratiation, and impenitence. As Notre Dame's drive to become a distinguished university was maturing in the late 1950s and into the next three decades, the time was neither right nor ripe for the massive growth that the university would experience. The vision of what this "great Catholic university" would be was too vague, the times were too tempestuous, and the philosophical reflection on the matter was too spotty and too superficial to serve as a guide on rough seas. Yet it was "full steam ahead," nonetheless. This is in part what I mean by impatience. But the really crucial factor was the infidelity, which effectively took the form of a gamble — made in the early 1970s in the wake of Vatican II and in the aftermath of the dissenting reaction to Pope Paul VI's encyclical Humanae Vitae — that some form of 'liberal' or 'progressive' Catholicism, freed from (or, to put it more neutrally, disengaged from) the philosophical and theological underpinnings of the past, would emerge as the 'serious' Catholicism of the future. Perhaps at the time this did not seem like much of a gamble. After all, a significant percentage of American bishops, along with their closest advisors, seemed perfectly comfortable with progressive agendas. In any case, at Notre Dame the attitude of dissent from and disdain for the Vatican played a significant foundational role in shaping hiring policies, tenure decisions, key administrative appointments, curricular reform, and admissions strategies for the next thirty years. Impatience and infidelity were then combined with an obsequious desire to imitate those schools that had already attained 'success.' Imitation was really the only possibility left open at this point, given that the 'Thomistic synthesis' that had previously served as the intellectual foundation for the distinctiveness of Catholic higher education had already been jettisoned by the progressives. The result was that, despite some relatively vapid rhetoric to the contrary, neither Notre Dame nor any other large Catholic university was in a position to challenge prevailing models of success in secular higher education with a detailed and self-confidently articulated alternative. So since at least the early 1980s Notre Dame has been struggling mightily to keep up with the Joneses amid what might fairly be called a culture of ingratiation. Policies were sometimes adopted for no other reason than that "this is the way they do it at Princeton (or Duke or Stanford or Vanderbilt, etc.)." (For those who need examples, I will cite just two recent ones: the top-down push for quasi-professional 'undergraduate research' in the humanities, and a new rule that prohibits professors from having close relatives enrolled in their courses.) The thought seems to have been that if only we imitate the others, they will accept us as a peer - and the hidden rider was always "despite our Catholicism" (and, one might add, "despite our big-time football program"). To be fair, there were obvious cases in which it was entirely appropriate for a growing Notre Dame to imitate more established and prestigious institutions of higher learning; for instance, by paying close attention to what other similar schools were doing, Notre Dame's endowment management team has become one of the best in the country. But there were just as obvious cases in which such imitation was inappropriate and should have been seen as such. Unfortunately, by this time the intellectual ramifications of the Catholic faith, which might have guided such decisions, had been set aside, the Catholic character of the university having already been relegated to the 'neighborhood.' Despite what the rhetoric of graduation weekend or of festive presidential installations might have suggested, the university was being led by pragmatists who did not have a comprehensive philosophical vision of Catholic higher education, or a correlative plan of action, to guide them. As time went on, the increasing antipathy of the many newly appointed faculty and administrators toward talk of Notre Dame's Catholic character served to reinforce the trends that the original infidelity had initiated. This brings us up to the present day and helps to explain how the more recent vibrant and faithful manifestations of Catholicism have slipped off the university's radar screen. But there have not been, and likely will not be, any apologies. This is what I mean by impenitence. At the beginning of the millennium, everyone on campus was happy to hear Pope John Paul apologize for the most egregious sins of his predecessors in the hierarchy of the Church. But don't expect Notre Dame administrators to issue an apology for past sins, or even to acknowledge those sins. I have often imagined a future president of Notre Dame walking in sack cloth and ashes down the "God quad" that stretches from the front of the domed administration building toward the statue of the Sacred Heart of Jesus and, beyond that, to the statues of Edward Sorin, C.S.C., the founding father of Notre Dame, and of Mary the Mother of God; he would be reciting the most egregious sins of past university administrators, striking his breast and begging for forgiveness. Somehow that could be the beginning of the salvation of the place I love so much. A pretty picture, to be sure. But short of direct divine intervention, nothing resembling it will ever become a reality — especially now that Notre Dame, like so many big universities, has been infused with the mentality of a frustratingly bureaucratic and, to put it frankly, soul-less corporation. The "four I's" have left little room in the minds of Notre Dame's leaders for Jesus Christ and his faithful followers in the Church. But what these leaders did not count on, and what has now in 2009 helped disperse the fog of ambiguity clouding Notre Dame's relationship to the Church, was the warm sunshine cast by the 26-year pontificate of John Paul II, followed immediately by the papacy of Joseph Ratzinger — along with the profound effect these holy and brilliant men have had and continue to have on the young people whom they have inflamed with love for Jesus Christ and his Church. As one commentator put it with a wry smile, "It almost reminds you of the Gospels." In the mid-1980s, a short time after John D'Arcy became bishop of Fort Wayne-South Bend, he had the name of the diocesan newspaper changed from The Harmonizer to Today's Catholic. Knowing the bishop's 'conservative' tendencies ("He's no friend of Notre Dame," I heard more than once in those days), a progressive friend of mine joked that they should have renamed the paper Yesterday's Catholic instead. But, ironically, as I looked around on May 17 at the crowd of mostly young students and young families who were in attendance at the alternative commencement rally on the south quad, I wondered aloud just who "yesterday's Catholics" were in 2009. Whose vision of the Church was leading to a dead end? And whose vision was instead inspiring young people to dedicate their lives to the Kingdom of God in opposition to the surrounding culture? Whose vision was turning out to be sterile and bourgeois? And whose vision was instead turning out to be fruitful? Since the mid-1990s there has been a continuous presence of what we might call JP2-Catholics within the undergraduate population at Notre Dame. This is still a fairly small minority of students; I would put the number at no greater than 5% of the total undergraduate population at any given time, though this estimate may be a bit on the low side. Still, the overall undergraduate population of the university is 8,500, and so at any given time there are several hundred students on the Notre Dame campus who are on fire with the faith and whose influence extends far beyond their own small circle. My close friend Janet Smith, who was a faculty colleague in the 1980s, turned to me during the alternative commencement rally on May 17 and marveled, "Nothing like this would have been possible in the '80s. We just didn't have as many students of this sort, willing to be witnesses to Christ no matter what others think." These are the young Catholics that the university has lost touch with. These are, in Chesterton's words, the children who are "fanatical about the faith where the fathers had been slack about it." One might reply that the university can easily survive without such as these. This is true enough in merely human terms. After all, a $6 billion endowment can go a long way in the City of Man. But the Notre Dame mystique has always, until now at least, included a reference to something more noble and more Christ-like than power and wealth and honor and fame. Without that something more, whatever survives might be impressive in many ways, but would it still be Notre Dame? The president of the university received three standing ovations at the annual faculty dinner on the Tuesday following commencement. To be sure, various lower-level administrators were circulating among the tables encouraging faculty members to applaud loudly and often. But most faculty members needed little such encouragement. The university administrators had stood up 'courageously'against their 'oppressors' in the Church, and in the eyes of the vast majority of faculty members they accordingly deserved high praise. But there are at least three unstable elements that could lead to further 'incidents' in the relatively short-term future. The first has to do with the university's relationship with the Church. John D'Arcy is at present the oldest bishop in the country who is still actively governing a diocese. His last public acts on the Notre Dame campus in the spring of 2009 were two impressive appearances at commencement weekend events sponsored by ND Response. Despite his original intention to forego the Sunday rally, "I realized that it was a requirement for the bishop to be present with these beautiful young people and with those whom they had drawn to Notre Dame and to a pro-life rally on the south quad." As long as he remains bishop of Fort Wayne-South Bend, the university is unlikely to reach out to him with anything like a public apology for its actions or its shabby treatment of him in the spring of 2009. This sad state of affairs in effect gives the new bishop, whenever he happens to come along, a completely free hand in dealing with the university. For 25 years Bishop D'Arcy pursued what might justly be called a conciliatory strategy toward Notre Dame, despite the fact (which he knew) that certain university administrators were continually laughing at him behind his back. On several occasions when I urged him to be a bit more aggressive in his dealings with the university, his reply was always the same: "What you don't know is how much worse the situation could have been if I were not operating as I do." However, given the new post-Obama circumstances, the next bishop will have no particular reason to be at all deferential to the university. Will he perhaps see his role as limited to overseeing the sacramental life on campus (no easy or insignificant task in itself)? 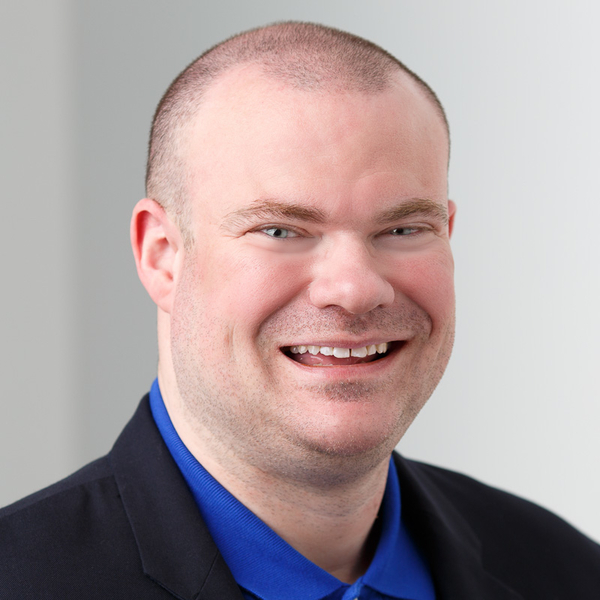 Will he perhaps feel disinclined to publicly validate the university every year by showing up as a token churchman at graduation weekend festivities? Will he perhaps even refuse to attend football games regularly as the university's guest? If no reconciliation has occurred before his arrival, will he simply sit back and wait for the university to take a first step toward healing "the breach" that Bishop D'Arcy spoke of? The answers to these and other similar questions will go a long way toward determining whether Notre Dame will be able to get away with insisting, as it would undoubtedly like to, that the pre-Obama status quo with the Church remains in effect, or whether instead the universi- ty will at some point be compelled by internal and external pressures to articulate with more precision its own conception of what its relationship to the Church is and should be. This latter, less pleasant, possibility would call for some tough choices on the part of the university. But suppose that the university chose instead to reinforce its Catholic 'brand' in some robust sense. Then it might well end up taking steps that either antagonize faculty members or conflict with certain institutional goals set by current administrators. Suppose, for instance, that the university decided to back up its claim to be "unambiguously pro-life." One obvious step would be to allow the Women's Care Center, a highly successful local pro-life pregnancy help organization, to open a branch office on campus — a move that, for whatever reason, the university has resisted in the past. Even this relatively innocuous initiative would undoubtedly irritate at least some faculty members. Another initiative, explicitly suggested by ND Response during the Obama controversy, would be to promise that the university will have nothing to do, directly or indirectly, with embryo-destructive stem cell research. But there are at least two ways in which such an initiative might conflict with institutional goals. First, current administrators long for the university to be accepted into the Association of American Universities (AAU), which includes as members all the peer institutions that Notre Dame seeks to emulate. However, the AAU is one of the biggest lobbyists in Washington for embryo-destructive stem cell research. Second, such an explicitly pro-life promise might jeopardize the university's current close relationship with the branch of the Indiana University School of Medicine that is located on the edge of the Notre Dame campus. And, more generally, any new moves that show even the least obeisance to the Church would immediately raise red flags in the eyes of the faculty. The second element of instability involves the Congregation of Holy Cross. To my mind, the Congregation is the biggest loser in the Obama affair. First of all, the fact that the Congregation's leaders did not respond strongly or straightforwardly to the university's action may very well result in a loss of vocations, which tend to come nowadays from among the JP2 Catholics. Second, I know from personal conversations that many of the Congregation's younger priests, along with a good number of the seminarians, were deeply discouraged by what they saw as the university's betrayal of the Catholic faith in the Obama affair. The Congregation can ill afford to lose any of these young people, but a continuation of the peace-at-any-price mentality that seems to have a grip on the older generation might well discourage them even further and add to tensions within the Congregation itself. Factors such as these weaken the Congregation and thus play into the hands of the many faculty members and administrators who strongly believe that Notre Dame's ties to the Congregation — beginning with the requirement that the president of the university, along with six of the twelve members of the powerful Board of Fellows, must be priests of the Indiana Province of the Congregation — retard the university's progress toward 'greatness.' It is not inconceivable that at some time in the short-term future there will be an organized movement to abolish such requirements and to push the Congregation into some sort of merely ceremonial relationship to the university. The third element of instability is just the "public school in a Catholic neighborhood" model itself, independently of the other two elements. Before I get to that, however, I want to emphasize just how attractive a model this is. First and foremost, it fits the present reality very well. This last point is important for understanding an otherwise puzzling phenomenon that occurred during the Obama controversy: Several of the newer Catholic intellectuals on the faculty did not want the students of ND Response to protest against the university's action; I am talking here about devout Catholics and in some cases daily communicants. Why were they of this mind? To put it straightforwardly, they are very happy at Notre Dame because they feel liberated here, whereas in the past they felt constrained or even oppressed at the more secularized schools where they were teaching. The protestors, they felt, were threatening this wholly acceptable status quo and might trigger a negative reaction that would drive the university in the direction of the sort of secularism that they themselves were very happy to have escaped. I find this an entirely reasonable position — even if not a particularly noble one, given what is at stake in the disagreements over beginning-of-life issues. I must confess that I myself was tempted to stay out of the fray when the honor for President Obama was first announced. I had long ago given up trying to 'save'Notre Dame, and while the honor for the President was indeed highly objectionable, so were lots of other things the university was doing. In the end, like Bishop D'Arcy, I came to feel that my place was with "those beautiful young people" of ND Response, many of whom I knew personally as their teacher and academic advisor. What really struck me in talking with them was how they continually and prayerfully examined and re-examined their own motivations: Is this for Christ or is it for us? Is this justifiable indignation or is it a personal vendetta? And so on. "These kids are sort of, well, holy," I thought, "Maybe they can save Notre Dame." And so I decided to shoot off my mouth one last time. It's been fun. In any case, the main point I want to make here is that the present situation is inherently unstable. The historical record laid out for us by authors such as George Marsden and James Burtchaell, C.S.C., suggests that what this "public school in a Catholic neighborhood" model describes is just a phase that the university is going through on its way toward eventually losing its soul completely. I pray that this is not so. So does Charlie Rice. 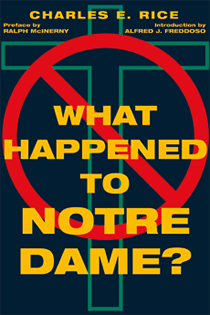 But one purpose of this book, unfortunately, is to show that the movement toward secularization at Notre Dame is much further along than most people would have believed before March 20, 2009.